Don’t be fooled by the tinted windows or the somewhat seedy exterior (i.e. purple and red neon signs, worn in seating and carpeting). Pekin Garden serves some great Peking duck – that is in fact, their specialty. We’ve been going here for years on and off, probably once every year or two. It’s a place that will do when you’re craving straight up Chinese food and some greasy, fatty, delicious duck. 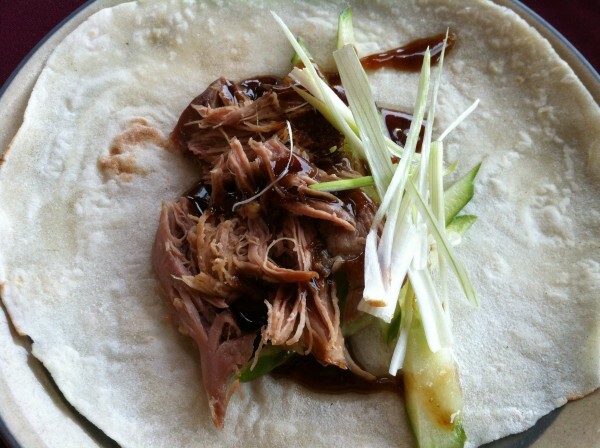 Crispy skin and tender meat cut right off the bone in front of you, the duck tastes best with a small handful of sliced cucumber, shallots and a little squirt of Hoisin sauce. Careful – too much and it will be very salty! All that wrapped up in a warm, doughy Chinese pancake and you’re ready to dig in. Yum. Apart from that, we had a tofu dish that came in a soya sauce thickened with corn starch accompanied by red and green bell peppers. We had a shrimp and scallop plate and some spicy fried eggplant. These were all mostly decent – nothing to get excited about. They’re more ‘authentic’ dishes in Chinese cuisine but the execution of them here was not so typical of the style. The temperature was lukewarm, maybe even at room temperature, so not very appetizing. The seafood wasn’t fresh and it was pretty obvious from the taste of the rubbery scallops and the less than juicy/crunchy shrimp. The fried eggplants actually had a nice spicy kick. The duck here is the real star of the restaurant, being its main redeeming dish. Come here if you want to eat an entire meal of this baby and you will leave satisfied. Tags: Chinese, Dinner, Dollard-des-Ormeaux, Duck, Eggplant, forkandtell, Fried, Lunch, Montreal, Scallop, Shrimp, Tofu, Wrap.